Even if “Southeast Asia” (SEA) is a recent concept, rooted in World War II,1 and even if heterogeneous toponyms have been used in the past to encompass parts or the entire region—such as Indochina, Insulindia, and Australasia2—this area has consistently been considered throughout history as a critical maritime lock between the East and the West. Because of the seasonal monsoons, indianized thalassocracies like the Funan and Sriwijaya as well as trade sultanates like Malacca and Demak took advantage of this strategic crossroads to successively manage the coasts and to shelter Indian, Chinese, Arab, and Western merchants. Today, Southeast Asia continues to be a critical node for travelers and traders, formal and informal flows, civilian and military people: the airports ofJakarta, Singapore, Bangkok, and Kuala Lumpur are respectively the eighth, tenth, fourteenth, and fifteenth biggest airports in the world in terms of passenger traffic3; Singapore is both the fourth biggest financial hub and the second port for containers in the world; in terms of oil flows, in 2011, 15.2 million barrels per day crossed the Malacca Straits while only 3.8 passed through Bab el Mandeb, in the Gulf of Aden.4 The region is made up of archipelagic states (Indonesia: 17,000 islands; Philippines: 7,000 islands) and many of its straits can be used by both merchant vessels and warships. The Asia Foundation, “Trustees and Officers.” Available online at http://asiafoundation.org/about/trustees-and-officers.php (accessed in May 2014). IISS, “Shangri-La Dialogue: The IISS Asia Security Summit.” Available at https://www.iiss.org/en/events/shangri-s-la-s-dialogue/about-shangri-la (accessed June 4, 2014). Logistics Group Western Pacific Public Affairs, “SEACAT 2013 Exercise Builds Multilateral Cooperation in Maritime Southeast Asia,” America’s Navy, NNS130902–03, February 9, 2013. Available at http://www.navy.mil/submit/display.asp?story-id=76306 (accessed May 2014). Lum, Thomas and Ben Dolven, “The Republic of the Philippines and US Interests— 2014,” Congressional Research Service, May 15, 2014. Cf. http://www.fas.org/sgp/crs/row/R43498.pdf. Manh Hung, Nguyen, “Oil Crisis in the South China Sea Prompts Vietnam to Consider Stronger Ties with the United States,” CogitASIA—CSIS, May 30, 2014. 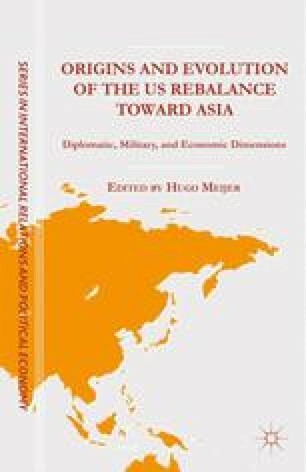 Available at http://cogitasia.com/oil-crisis-in-the-south-china-sea-prompts-vietnam-to-consider-stronger-ties-with-the-united-states/ (accessed in May 2014). “MRSS For RMN In RMK-11,” Malaysia Flying Herald, April 28, 2014. Available at http://malaysiaflyingherald.wordpress.com/2014/04/28/mrss-for-rmn-in-rmk-11/ (accessed in May 2014). United Nations Institute of Peace, “Glossary of Terms of Conflict Management and Peacebuilding.” Available at http://glossary.usip.org/resource/tracks-diplomacy (accessed April 2014). UNODC, “Indonesia: Trafficking and Organized Crime.” Available at https://www.unodc.org/indonesia/trafficking-organized-crime.html (accessed May 2014).